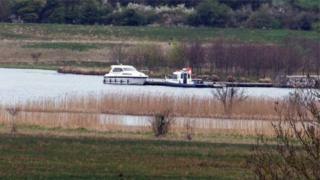 A man charged with murdering his wife during a boat trip in County Fermanagh is due to go on trial in September. Lu Na McKinney, 35, died after entering the water at Devenish Island on Lough Erne in April 2017. Her husband, Stephen McKinney, 42, of Castletown Square in Fintona, County Tyrone, denies the charge. His bail conditions have been eased to allow him to visit his wife's grave on the anniversary of her death. On Friday at Belfast Crown Court, Mr McKinney was asked how he pleaded to the charges. The clerk said: "I beg you pardon? ", to which the accused replied: "Not guilty." The judge informed the court that the trial, which is due to begin at the end of September, will last for about a month. A defence barrister highlighted a bail condition of Mr McKinney's prevented him from entering Strabane in County Tyrone. He asked the judge to amend the condition to allow his client to visit his wife's grave. The judge replied: "I will vary the bail to permit that."